A friend of mine is flying the coop. She is starting to pack up her house in Newton, counting the days until she and her husband move into a small, Back Bay condo. She dreams of meandering along the Charles, hand-in-hand, strolling to the theater and eating al fresco under the stars. All this, and no parking tickets! But after dropping another book triumphantly into a carton, her daughter screamed, “Stop it! I can’t take it anymore!” Talk about ruining the moment. My friend had talked to her only child about moving far in advance. The high school senior is graduating from high school soon and was nonchalant at first. However, the reality of overflowing cardboard boxes and empty shelves set in, and the girl’s negativity reared its ugly head. This was something my friend hadn’t planned on. Fortunately, the daughter has come to terms with the move, but it’s traumatic nevertheless. Imagine growing up in the only house you’ve ever known, only to be ousted right after you finish high school? Won’t she miss her own bed when she comes home on break? As high school seniors prepare for graduation, the empty nest looms – for some parents. For others, maintenance-free living in smaller quarters dances in some parents’ heads like sugarplums. In fact, according to stageoflife.com, 36 percent of baby boomers will move out of their homes when becoming empty nesters. Stress levels: If you are reeling because your only (or last) child is leaving the nest for college, have a very ill relative or are anticipating other difficult situation, wait. According to the Holmes Rahe stress scale, “a change in living conditions” ranks 30 out of 43 of life’s most stressful events. The scale also shows that having a child leaving home is even more stressful (than moving), on the same scale. The importance of the house: How attached is the child? How does he or she feel about not returning to their childhood home? Arthur Kovacs, a San Diego-based psychologist, says caution is best when making a move, and be sure to talk about it with the kids. If parents move out of the family home, particularly while the child is away at college, it can be especially traumatic. “Young people don’t feel important. They feel like their life can be wiped away.” On the other hand, if you have moved several times, your child may not be as attached to the home and moving will be much easier. The relationship: Some kids come home often. Some don’t. If you are close to your kid(s), consider that they will want to visit and stay overnight. If you have more than one adult child, can they share a room? Will he/she bring friends? During the holidays this will be a consideration. Many parents, no matter how young their kids are, dream of grandchildren. Will you have room for everyone? What if your kid(s) want to move back home? According to recent figures from Pew Research, 32 percent of adults ages 18-34 live at home with their parents. What if they lose their job? Do you want to provide a safety net? Can you make money moving? : That penthouse in the city sounds amazing. But if you are going to go into debt to move, it doesn’t make sense. On the other hand, if you get a good deal on a new condo in Watertown, Waltham or another surrounding community, and make a profit, it makes sense to sell. Or, if moving saves you a bundle on property taxes. Of course, if your house is paid off, and you can pay cash for a new place, that’s generally a good idea. Bridging the Gap: Being able to move to your new home, before you put your existing one on the market, is the best case scenario, if you can afford it. This enables you to move out gradually, clearing out clutter, a few boxes at a time. On the downside, carrying two mortgages is no picnic. For some people, a home equity line of credit makes sense, so they can put a down payment on their new place. Retired homeowners might want to look into taking out a reverse mortgage. This can be used for the purchase of the new home. Once the current home is sold, the proceeds from that sale can be used to pay it back. 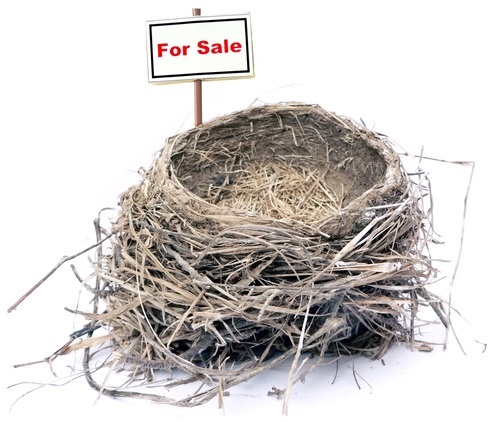 The cost of staying put: Doing a simple exercise will help you evaluate whether or not you keep the nest intact. Calculate the cost of your empty room. Do this by dividing your total home expenses by the total sq. ft. of the house. Multiply that by the sq. ft. of the empty bedroom(s). That number will tell you how much you are spending to keep that room(s). Can you stay another 10-20 years? If you have a bathroom and bedroom on the first floor and have a large family who visits often, it might make sense to stay put. If you end up retrofitting your home to make things easier, think about how it will affect the re-sale value. I showed a house recently that had a closet in the dining room that stuck out like a sore thumb. If you install things like a stair climber, a walk in tub and grab bars, you won’t get the highest price you can. Many buyers want to move right in, with minimal repairs or renovations. Note to readers: Ms. Presti is a real estate educator for Newton Community Education who has taught more than 100 courses. She is teaching “How to Sell your Home for More in Today’s Market” on May 2; and “A First-Timer’s Guide to Home or Condo Buying” on May 9 & 16. Call NCE at 617-559-6999 to register, or sign up online.